The thinking behind this false doctrine goes something like this. God knows we are all humans....created in His image. He knows we are not perfect in our human state. He knows that we are all sinners because He says so in the Bible more than once. Since God knows all of that, does He really care that we sin? After all, everyone does it. He expects it. It's easy for things to get twisted when you mix the truth with a lie and put it all together. The above statement does have some truth to it. We are created in God's image (Genesis 1:27), and the Bible does say everyone is a sinner (Romans 3:23). That's the exact reason He sent His Son, so that all of us (the world - John 3:16) would have an avenue for forgiveness, that we are all in need of, because we are all sinners. All of that is true. Where these Bible truths get twisted, is when things are added to, or taken away from, God's word...like the lie that because He knows we are sinners, He doesn't mind it. God doesn't like sin, never has never will. He is the same today as He was yesterday and will be tomorrow. God does offer a way to be forgiven when sin occurs but believe me when I tell you this, He would have preferred not to have to see His only begotten Son, bleeding, in pain, crucified on the cross, feeling like His Father had forsaken Him for the moment, for sins He didn't even commit. God doesn't like or condone a sinful lifestyle. He gives all of us free will to choose...and sometimes we do choose sin, but that doesn't mean God doesn't mind it. It saddens God when the world sins but especially when a believer in Jesus struggles with sin. That is because He has empowered each believer with the gift of the Holy Spirit so that sin can be overcome in each instance. When temptation comes the believers way there is always a way out. All sin has consequence. Depending on if you have a relationship with Jesus or not will determine the consequence of that sin. It saddens God when a believer intensionally chooses sin. Believers are adopted into God's kingdom because of our faith in His Son. We...the believers....the earthly body of Christ, represent Jesus who represented the Father. When we are good then God is represented well. But when we intensionally embrace a sinful lifestyle, then God is still represented by us his children, but in a way that does not bring Him honor and glory. The question of should we sin more because then Gods glory might be greater, because of saving an even bigger sinner, comes up in the Bible. Let God answer this question for you through the Apostle Paul, who when writing the book of Romans was writing under the inspiration of the Holy Spirit. This is the will of God,... that you should abstain from sexual immorality; that each of you should know how to possess his own vessel in sanctification and honor, not... like (those) who do not know God (1 Thessalonians 4:3-5). So its pretty clear from Gods own words that we should make an effort not to sin. This will cause us to grow closer to the Father and be more like Jesus. Sin just puts distance between us and our Father. At the very least, intentional sin stunts our spiritual growth. God really does mind it when we have a sinful lifestyle. 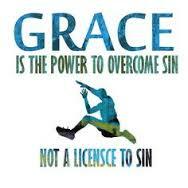 Grace image from Google images.